They warn the attacker could be at large outside Spain. People stand next to candles and flowers placed on the ground. THE MANHUNT FOR the main suspect in last week’s Barcelona attack has been extended to all of Europe, a Catalan government official said this morning. Catalonia’s interior minister Joaquim Forn told local radio that Spanish authorities were officially notifying European police of the identity of the driver who ploughed his van into crowds on the busy Las Ramblas district on Thursday. “We have to talk to European police to notify them of the identity because this person… is likely being sought in all European countries,” Forn said. Earlier Spanish authorities said they hoped to identify all 14 victims of the deadly attacks in Catalonia and the members of the terror cell behind it, as a manhunt deepened for one suspect still at large. With the 12-person cell dismantled, police were hunting a 22-year-old Moroccan man, Younes Abouyaaqoub, suspected of driving the van used in Barcelona. Investigators believe the terror cell comprised at least 12 men, some of them teenagers. An imam, Abdelbaki Es Satty, 40, is among the suspects, believed to have radicalised youths in Ripoll, a small town at the foot of the Pyrenees, where several suspects – including Abouyaaqoub – grew up or lived. The imam has been missing since Tuesday. On Saturday, police raided his apartment. They have raised the possibility that he died in an explosion Wednesday evening at a house believed to be the suspects’ bomb-making factory, where police uncovered a cache of 120 gas canisters. The suspected jihadists had been preparing bombs for “one or more attacks in Barcelona”, regional police chief Josep Lluis Trapero told reporters, revealing that traces of triacetone triperoxide (TATP) – a homemade explosive that is an IS hallmark – had also been found. The suspects accidentally caused an explosion at the house on the eve of Thursday’s attack in Barcelona – an error that likely forced them to modify their plans. 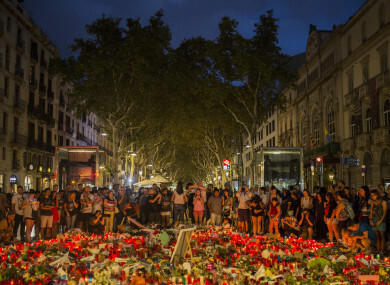 Instead, they used a vehicle to smash into crowds on Las Ramblas boulevard as it was thronged with tourists, killing 13 people and injuring about 100. In the small town of Alcanar, investigators combed the rubble of the house believed to be the suspects’ bomb factory, where the gas canisters were uncovered. A neighbour, 61-year-old French retiree Martine Groby, told AFP that four men “who all speak French” had been in the house next door since April. Email “Police extend search for Barcelona attacker to all of Europe”. Feedback on “Police extend search for Barcelona attacker to all of Europe”.